Harvested hardwood logs are piled up before being trucked from a J.D. Irving Ltd. logging site in this February 2014 file photo. PORTLAND, Maine — Timber doesn’t flow literally on Maine’s waterways any more, but it does flow in and out of the state. Mostly, it flows to Maine, not out of it. 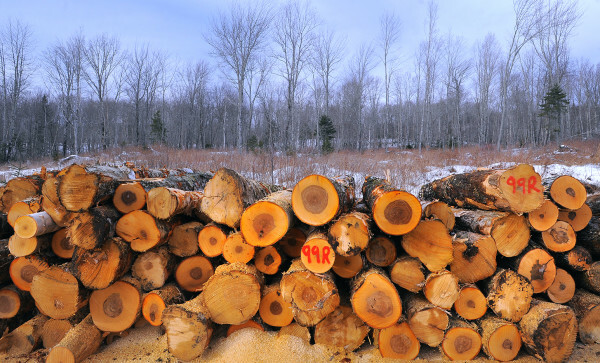 For the most heavily forested state in the country, it may seem counter-intuitive, but there are a lot of reasons why Maine gets its wood from elsewhere — and, it’s not a bad thing, according to Patrick Strauch, executive director of the Maine Forest Products Council. That is, Strauch said, Maine benefits from being able to access wood fiber from various places where the manufacturing demand for wood might not be as high. And the other thing to consider — as with most other economic analyses — is that the forests don’t stop or change character at the edge of Maine’s political boundaries. “Wood’s going to move in multiple directions depending on the economy,” Strauch said. They also are a crop — one that admittedly takes a long time to grow, but that does depend to some degree on the weather and timing. “It depends on building inventory around the mud seasons and calculating how much you need to get through that season, because we can’t harvest on muddy ground,” Strauch said. The last year Maine was a net exporter of all varieties of wood products — including sawlogs, pulpwood, biomass chips and firewood and pellets — was 2006, when International Paper negotiated the sale of its mills in Jay and Bucksport to new investor, Verso Paper. In total in 2013, Maine exported about 849,500 cords of wood while importing a little more than 1 million cords. Within that total, pulpwood is the largest category harvested in the state and the largest category imported, by volume, as it’s used in papermaking. As a result, it typically makes or breaks whether the state is a net importer or exporter of wood. In 2006, pulpwood imports exceeded exports by less than half the amount of the previous year. That is, pulpwood imports were about 250,000 cords higher than exports in 2006, compared with imports beating exports by about 600,000 cords in 2005. In 2013, imports were about 450,000 cords higher than pulpwood exports, according to the Maine Forest Service’s latest Wood Processor Report, and the service noted that some curtailments at pulp mills, such as in Old Town, led to incomplete data and under-reporting. Sawlogs are typically sent out of the state, with about 145 million more board feet sent out of state than brought into Maine for processing. In 2013, Maine imported about 110 million board feet of sawlogs, exported about 255 million board feet and processed 624 million board feet from trees harvested in-state. While the state was a net importer of wood in the latest period, Strauch said that could change with a few key developments that are expected in 2015. Among them is Wisconsin-based Expera taking over the pulp mill at Old Town Fuel & Fiber and Woodland Pulp in Baileyville completing construction on two tissue paper machines. And changes in the manufacturing sector also can affect which types of wood are in the greatest demand. For the most part, those imports are coming from the other New England states, New York and the Canadian provinces of New Brunswick, Nova Scotia and Quebec. Exports travel to a wider variety of states, including other New England states, Delaware, Indiana, Maryland, Michigan, Pennsylvania, New York, Virginia and China and Thailand. Correction: A previous version of this story misreported sawlog exports by a factor of 1,000. The measurements, which are in increments of 1,000 board feet, have been corrected.